We cannot say the future is predictable, because we can't say in advance what will happen with certainty. However to see some of the latest changes in technology play out has been, for those familiar with the predictions, unsurprising. In early 2013 I picked up a copy of the book The Mobile Wave by Michael Saylor. Saylor 4 years ago made the argument that the changes brought by mobile computing will be big, widespread and become an essential tool of modern life. And I dare anyone to argue in 2017 that this isn't what in fact has happened. Of course Saylor wasn't the only one to make this prediction and that is a case in point. While this revolution happened before our eyes it was much commented upon and well documented in the media. In 2016 we passed 2.5 billion smartphones and are headed for 5 billion . I'd argue that this has happened with a number of verticals, CryptoCurrencies which were hyped around the same time as Saylor's book came out and in 2017 have a market cap of over $100 billion . The same has happened with TV streaming, online education, electric cars, bicycles, the sharing economy and social media. Even if it's pretty unsurprising and forseeable what's happening, it is much harder to correctly guess who the leaders in their industry will be. This AT&T commercial from 1993 is a great example of this except that hardly any of this innovation came from AT&T . If we knew who will emerge as the winners in their respective markets and drive innovation Venture Capital investments would be easy, but that is not the case. It wasn't always clear that Facebook would beat MySpace, that Instagram would be Hipstamatic, that Bitcoin would survive or that Ethereum would do well, or if it's Uber or Lyft who become market leaders. What are the next trends which will have widespread impact? Quantum computing, self driving cars, meditation, more blockchain tech and more of all of the above? Another interesting lesson from this commercial is that it promises a future of sending faxes from the beach. That is almost what we do today, except that we can send email or chat messages from the beach and hardly anybody sends faxes anymore. Often when imagining the future we think we'll do what we do today, but with something new added in, similar to the picture on top. 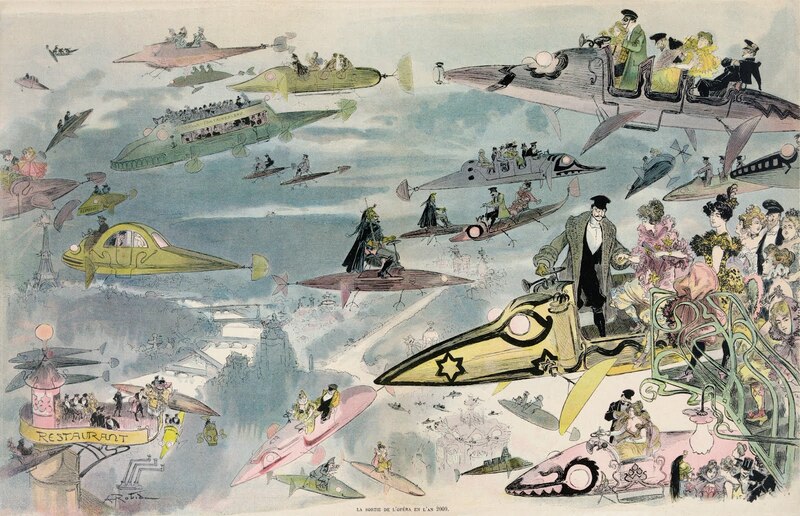 It depicts a vision of Paris in the year 2000 made in 1882, where people still go to the opera but just in flying cars. I also became aware of this analogy in a podcast with Benedict Evans as guest.